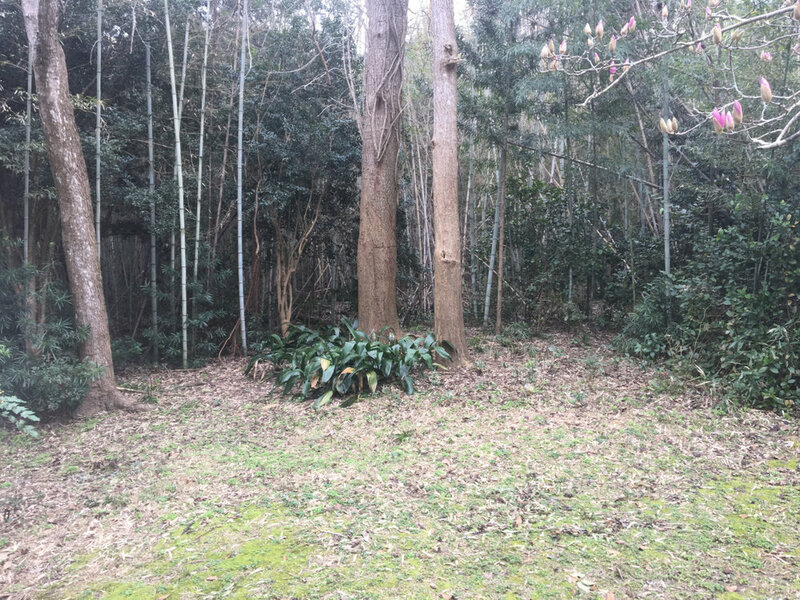 On December 17, 2017, I walked along the edge of a forest in Jungle Gardens. It was a path I had taken many times earlier that year, only this time a single fallen leaf caught my attention. Its brilliant yellow color and familiar shape belonged to a tree I knew very well but had never seen in the gardens. It was Ginkgo biloba, the maidenhair tree or Ginkgo tree. I was so surprised to see this leaf that I continued searching the area. As I got closer to the edge of the woods, the number of Ginkgo leaves increased until the ground was covered with them. But, where was the tree, and how could I have missed it previously? 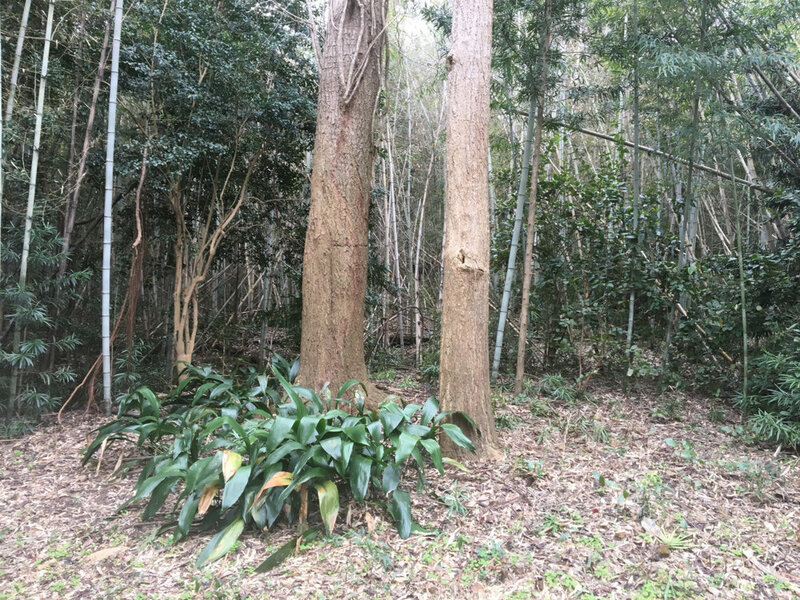 The forest in this area is compose primarily of large bamboos, as well as Viburnum suspensum, Podocarpus macrophyllus (Japanese Yew) and Cinnamomum camphora (Camphor tree). 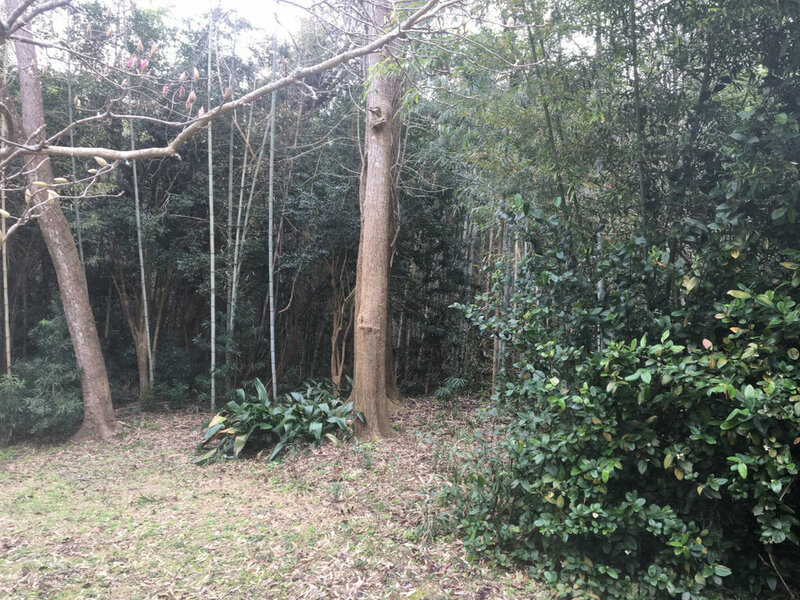 The dense growth of viburnum mixed with culms of bamboo created an impenetrable wall that concealed everything in the forest growing behind it. 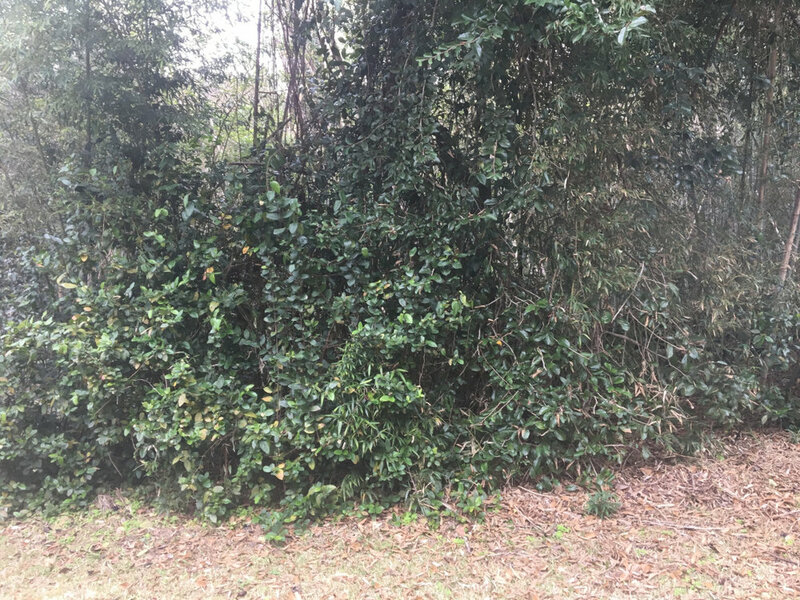 I made my way into this tangled jungle of plants, and about 12 feet into the brush I came upon two very large, tall trees growing only a few feet apart. When I looked up into their canopy I immediately knew I had found the source of the Ginkgo leaves. Both trunks were covered in large vines and completely obscured from visibilty. I carefully studied the area where they were growing. The abundance of seedling Ginkgoes all about the forest floor near the trees indicated the two Ginkgoes were male and female. A substantial planting of Aspidistra elatior, the Cast Iron plant, grew around the base of the Ginkgo trees, a clear indication of prior landscaping. At one time the Ginkgo trees and the Aspidistrawere at the forefront of the edge of the forest. Over many decades the other, more aggressive plants mentioned above engulfed the area and obscured the landscaping and the Gingkoes. Over the weeks that followed I took it upon myself to cut back the forest. I removed all of the weedy introduced plants and vines covering the trees, revealing the Ginkgoes and Cast Iron plants as they were meant to be. Both trees are very tall, though one is considerably larger than the other. The larger tree is 24 inches in diameter and the smaller 14 inches. While there bases are 5 feet apart, many of their limbs touch and coil around each other. Spring came and the trees began to leaf out. With the aid of binoculars I was able to determine which tree was male and which female. 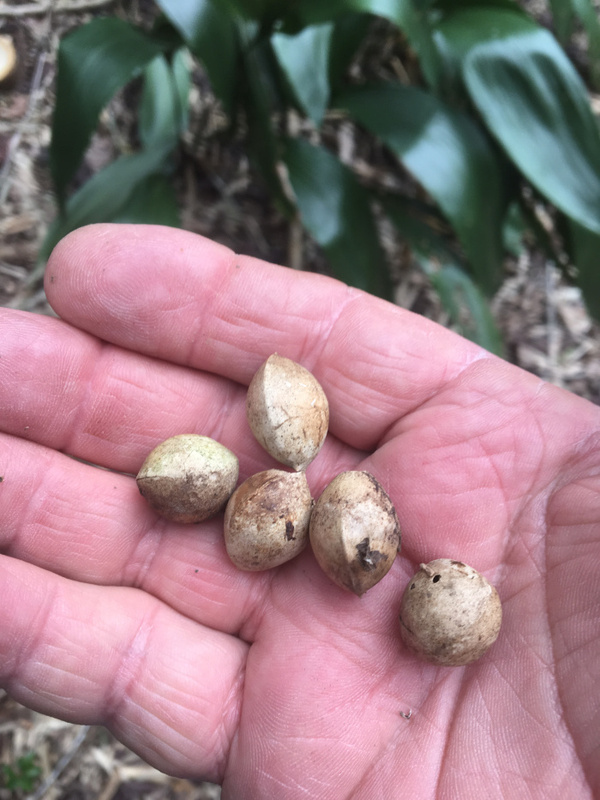 By mid-July I began finding freshly fallen Ginkgo seeds. Generally Ginkgoes shed their seeds in Autumn. Perhaps their early release was due to the heavy rains experienced those weeks. The many seedlings growing around the adults are mostly 6-7 inches tall, although some are 12 or even 14 inches tall. 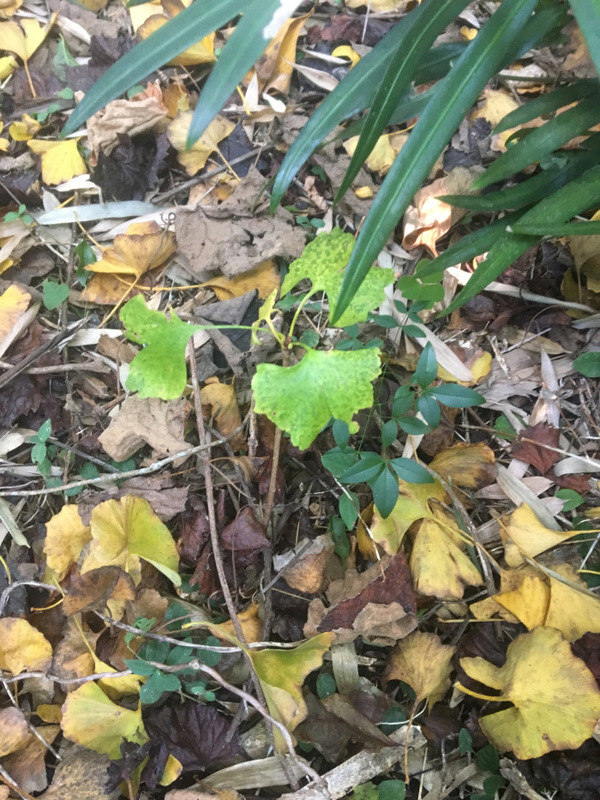 This fall and winter I plan to explore the wooded area behind the Ginkgo trees to see if perhaps older seedlings are present. The Ginkgo trees of Jungle Gardens are once again easily seen, in full view in front of the forest as they were intended to be.